Another tidbit regarding the iPod. Apple’s music player brand still holds a 78 percent market share a decade since its launch. Quite impressive. 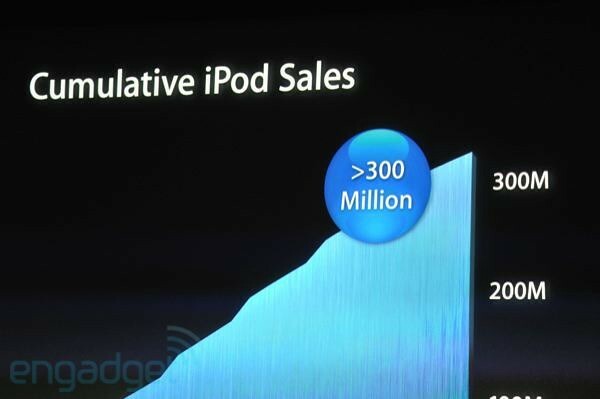 They sold over 300 million iPods to date. “It took Sony 30 years to sell 220,000 Walkman cassette players,” Apple CEO Tim Cook remarked. We take it that means the iPod classic isn’t going away. The iPod family of music players still have a lot to offer, he said, noting that nearly half of sales are from users who already own one. Apple shipped 45 million iPods from July of last year to June of this year. As for iTunes, the online music store now commands a 20 million songs-strong catalog. Remember, iTunes Store launched with just 200,000 songs.